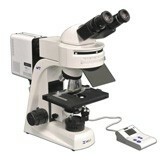 Meiji Techno's new MT6200CW Series binocular laboratory grade upright microscopes are the new Biological with LED Epi-Fluorescence. The MT6200CW Series employs Meiji Techno's all new ICOS™ (Infinity Corrected Optical System) making the study of mounted specimens fast and easy while delivering an excellent cost-to- performance ratio. 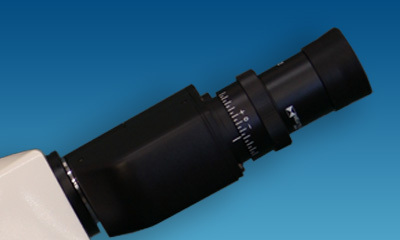 The MT6200CW Series microscopes are configured for Brightfield and Epi-fluorescence but can also be outfitted with optional Phase contrast, Polarized light and Darkfield components. System modularity makes purchase and operation very affordable for colleges, universities, researchers and clinics. Epi-Fluorescent with LED advantages, such as intensity from a conventional lamp decreases through its life, which means that illumination varies dramatically over time. The lifetime of LED’s far exceeds that of these older lamps, ex. Mercury, Metal Halide, Xenon models and intensity remains broadly constant throughout its life providing a stable, repeatable light source. Some of the many fluorophores excited by the PE-300 CoolLED add-on series are FITC, DAPI, Cy3, Auramine, TxRed, mCherry, TRITC, ChR, Hoechst, Cy5, Calcofluor, RFP to name a few. Secondly decide on the proper Meiji Techno CoolLED illumination unit for your application. Simple to Choose: No alignment or adjustment needed once installed, already configured for your everyday fluorophores such as DAPI, FITC, TRITC & Cy5 and affordable through your lab consumables budget. 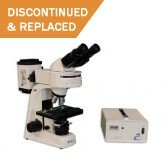 MT6200CW Binocular Microscope with Epi-Fluorescence is an optical biological microscope that uses fluorescence and phosphorescence instead of, or in addition to, reflection and absorption to study properties of organic or inorganic substances. 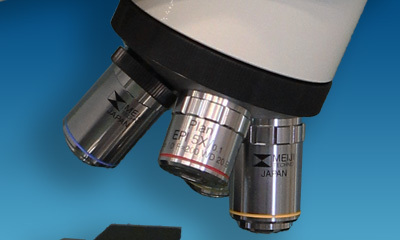 The “fluorescence microscope” refers to any microscope that uses fluorescence to generate an image, whether it is a simple set up like an epifluorescence microscope, or a more complicated design such as a confocal microscope, which uses optical sectioning to get better resolution of the fluorescent image. Equipped with Chroma filters and a six position filter holder, there is a slot to add 3 more filter cubes and desired filters for your specific experiment or application. The intensity from a conventional lamp decreases through its life, which means that illumination varies dramatically over time. The lifetime of LED’s far exceeds that of these older lamps, ex. Mercury, Metal Halide, Xenon models and intensity remains broadly constant throughout its life providing a stable, repeatable light source. Some of the many fluorophores excited by the PE-300 Series are FITC, DAPI, Cy3, Auramine, TxRed, mCherry, TRITC, ChR, Hoechst, Cy5, Calcofluor, RFP to name a few. PE-300W/LEDMT is a LED fluorescence illumination kit, configured for fluorophores such as DAPI, FITC, TRITC & Cy5, adds greater control options to the platform, 3 channel control pod allows selection and control of excitation wavelength whether its to balance your FITC against your TRITC or to minimize bleaching by exciting only the markers that you are working. Supported by popular imaging software giving integrated control with your imaging set up time after time. An additional benefit of the PE-300W/LEDMT is that stains can be viewed either individually or in combination, without filter cube changes. This makes it ideal for use with multi-band filter sets as the screening process can be simplified when fewer filter cubes are used. Independent control for the three LED channels means that the user can control the level of excitation of each fluorescent stain independently on a multi-stained samples, potentially removing the need for single band filter sets altogether. Instant on/off with the ability to optimize intensity and minimize sample damage via the simple desktop Control Pod with a manual control pod and power supply. The MT6200CW Series employs Meiji Techno’s all new ICOS™ (Infinity Corrected Optical System) making the study of mounted specimens fast and easy while delivering an excellent cost-to-performance ratio. 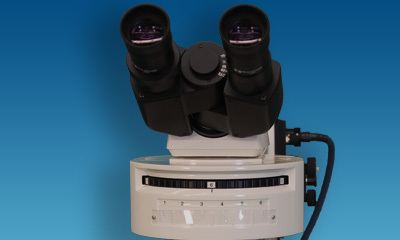 The MT6200CW Series microscope are configured for Brightfield and Epi-flourescence but can also be outfitted with optional phase contrast, polarized light and darkfield components. System modularity makes purchase and operation very affordable for colleges, universities, researchers and clinics. • MT6200CW: Binocular Epi-Flourescence /Brightfield Compound Microscope with Quintuple Nosepiece and PE-300L/LED MT CoolLED incident light source and LED transmitted illumination. •PE-300W/LEDMT: LED fluorescence illumination kit, configured for fluorophores such as DAPI, FITC, TRITC & Cy5, adds greater control options to the platform, 3 channel control pod allows selection and control of excitation wavelength whether its to balance your FITC against your TRITC or to minimize bleaching by exciting only the markers that you are working. Supported by popular imaging software giving integrated control with your imaging set up time after time. An additional benefit of the PE-300W/LEDMT is that stains can be viewed either individually or in combination, without filter cube changes. This makes it ideal for use with multi-band filter sets as the screening process can be simplified when fewer filter cubes are used. Independent control for the three LED channels means that the user can control the level of excitation of each fluorescent stain independently on a multi-stained samples, potentially removing the need for single band filter sets altogether. Instant on/off with the ability to optimize intensity and minimize sample damage via the simple desktop Control Pod with a manual control pod and power supply. NOTE: The size of these images will vary and some images have been re-sized to fit this page. Do not rely on the size of these images to determine which bulb you need. 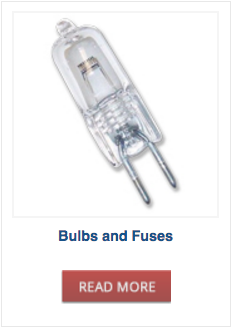 Click HERE for more Bulb info. 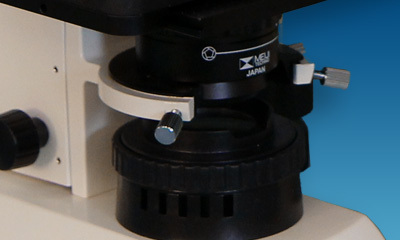 Light bulbs in microscope illuminators need to be replaced periodically. The bulbs on this page are most commonly used in Meiji Techno illumination systems. 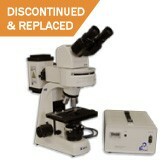 If you own a Meiji microscope and need a replacement, you should be able to purchase it at your local Meiji Dealer. 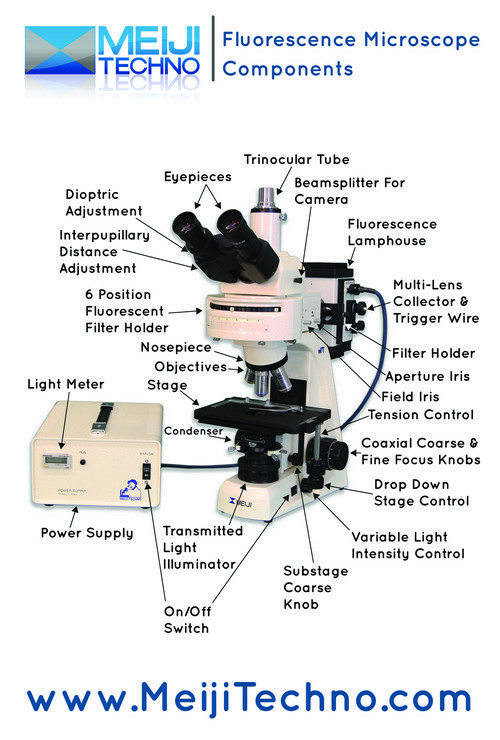 Some older models or specialized microscopes may use bulbs that are not listed here. If you cannot find the correct bulb, please contact our technical support staff to assist you. Click HERE for information on Lamp Safety, Handling and Disposal. Bulbs have a rough life in a microscope: burning in an enclosed area for hours on end with a finite lifetime, the effects of too much heat and not enough ventilation, DC current from the dimmer circuit slowly thinning the metal of the filament. And with bulbs nowadays being manufactured more and more cheaply, the cumulative effect is not good for bulb longevity. If the bulb is halogen or DC Arc Lamp type, DO NOT TOUCH THE GLASS with your bare hands when installing bulbs. Use the plastic bag it comes in to install the bulb. 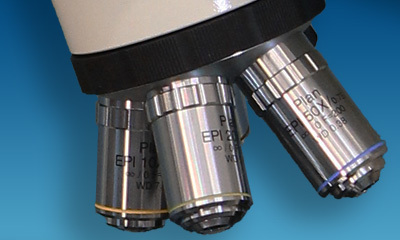 DO NOT jar or bump or run your scope in an environment that has excessive vibration. Turn your scope off if you do not need it on. Some bulbs have a rated life of only 100 - 200 hours so if you use your scope full time, be prepared to use bulbs. 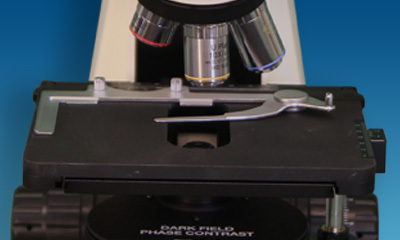 Halogen bulbs in microscopes and fiber optic light sources can also have problems if the socket is worn out; i.e. the connection cannot sink enough heat away from the bulb and/or the electrical connection is weak. If your scope is an old workhorse who's starting to eat bulbs, check the bulb socket out for poor contact and discoloration of the contact. The bi-pin type bulb should push stiffly into the socket. If not, or if it wobbles around excessively, the socket is too old and needs replacement.